You might not find a lot of information about New River when searching the internet. It is a taste of the old "Wild West" with both rugged beauty and individualism coming together in one place. Just a mile north of Anthem, it is close enough to experience its benefits, but still far enough away for peace, serenity and scenery! The northernmost parts of Anthem are addressed as New River itself (Anthem West and Arroyo Norte), and there is the community of Arroyo Grande across the New River from Anthem and accessible only by way of New River Road. The southeast border of New River is shared with Desert Hills, another community reminiscient of the old West, but with a little flatter land and open space. 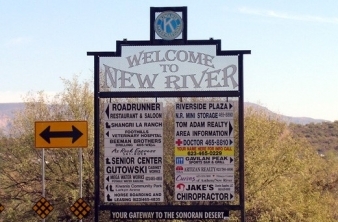 New River is an unincorporated community and a census-designated place (CDP) in Maricopa County, Arizona, United States. The population was 14,952 at the 2010 census. New River is named after the seasonal wash of the same name, part of the Agua Fria River system which drains into the Salt River. It was founded by Lord Darrell Duppa in 1868 as a stagecoach stop. For many years it was the terminus of the old Black Canyon Highway (now Interstate 17). The pavement ended in New River and continued as a dirt road to the city of Prescott.